Parts of the UK are braced for more flooding as the Environment Agency warns of "intense bursts of rain". A Met Office severe weather warning is in place for much of Wales, with heavy rain expected overnight. Heavy rain will also affect western England. The rain is expected to swell rivers, raising the risk of flooding for the Midlands and the South West. Severe weather has already closed roads, hit travel and threatened homes across England and Wales this week. Environment Agency area manager Paul Tullet said he believed rivers could deal with the predicted rainfall. "We can expect intense bursts of rain, but over the period it is not looking too bad and rivers can cope with the level. "We are concerned about the River Severn. It is steadily dropping, but will soon be elevated by rain from north Wales." He added: "Our current prediction is that there will be some low-lying flooding on smaller roads and fields. If we have a heavy downpour of rain, that can be unpredictable, but we are not thinking that is going to be a major issue." The agency has issued a warning to homeowners in areas vulnerable to flooding from the rivers Severn and Trent in the Midlands to move their valuables upstairs and tie down garden furniture in anticipation of a deluge. Flood defences were put in place in Frankwell in Shrewsbury and on the Wharfage in Ironbridge, Shropshire. On Friday afternoon, there were 43 flood warnings in place, including several in Worcestershire and Gloucestershire, which were badly hit by flooding in the summer. Oxfordshire is also braced for flooding, with 17 homes in the village of Kelmscott, in the west of the county, already damaged by 3ft (0.9m) of water. An Environment Agency statement covering the weekend said: "We are warning people across the Midlands to prepare for flooding again over the next few days, as the latest weather forecast from the Met Office is predicting heavy rainfall. "While everyone living in a flood-risk area should remain vigilant, we believe that flooding is especially likely to occur on the Severn and its tributaries north of Shrewsbury, and in Gloucestershire. "Along the lower reaches of the Trent and its tributaries - Nottinghamshire, Leicestershire and Derbyshire - we are expecting a slight worsening of the current situation." Princess Anne has visited flood-hit residents living in caravans in Tewkesbury, Gloucestershire. The princess arrived at the Canterbury pub on her second visit to lend support to local people since last summer's floods. "They seem to be coping remarkably well," she said. 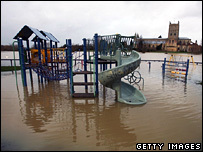 Tewkesbury, one of the worst-affected towns during last summer's flooding, has been victim to the rising waters again. High winds are expected to add to difficult driving conditions in some parts, with motorists urged to take care. Rail services are being disrupted in the South West, Powys and Hampshire, with replacement bus and taxi services running.